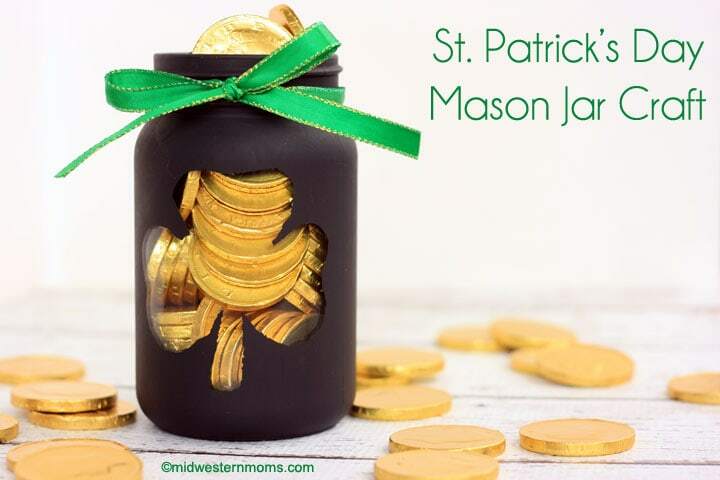 Make a cute Pot of Gold with this easy St. Patrick’s Day Mason Jar Craft. I chose to re-purpose the mason jars that I used in my Christmas Treat Jar for Pets craft into this Pot of Gold. For the shamrock cut out, I just found a clip art to cut out and cover the area of the jar that I wanted to keep unpainted. You can use machines like a Circut or a Silloute, if you have them, to make the shamrock for you. If your Mason Jar is brand new, you may not have to clean it. If you are using a used jar, make sure it is washed and then rub the outside with rubbing alcohol. Once your jar is dried completely, move on to the next step. Attach the shamrock cut out to your mason jar. I rolled up scotch tape and put it on the back of the shamrock and attached it that way. Don’t have any tape that comes out from under the shamrock. This could cause a place where you wanted painted not to be painted. Start painting your jar with your black paint. Be careful when going around your shamrock. I found it best to place your brush on the cut out then brush paint moving off the cut out onto your jar. Once you have one coat of paint on the jar, allow to dry 24 hours before applying the next coat. Apply the second coat of paint to the jar. Allow to dry completely before moving on. I waited another 24 hours. Gently remove the shamrock from the jar. If you got some paint where you don’t want it, scrape it off gently. Spray the top coat on the jar to seal it. I didn’t spray my jar with a top coat, but I should have. I noticed when adding the ribbon, it easily scraped off. If I were to do it again, I would spray it with a top coat for sure. Tie a ribbon round the neck of the jar. 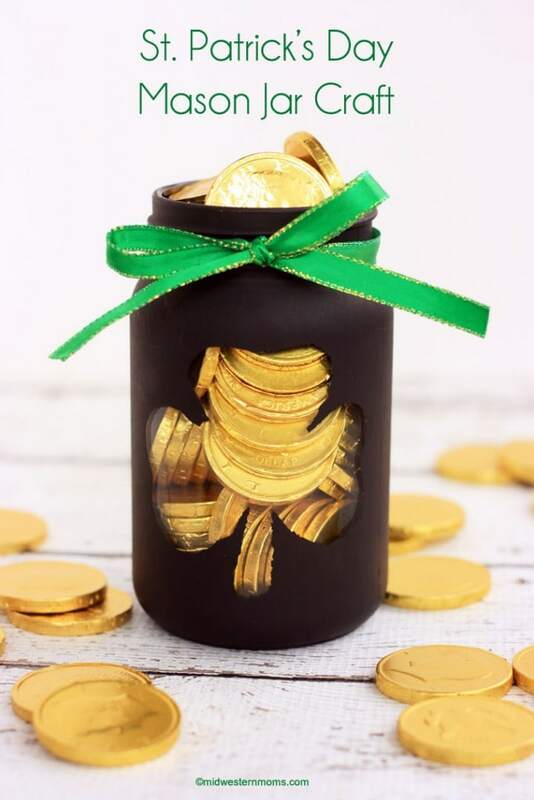 Add your gold coin chocolate candy. Your pot of gold is finished! Enjoy!